Both the High School and Middle School Competitive teams hit the mat last night to compete in the SEC Jamboree #1 held at Adrian High School. 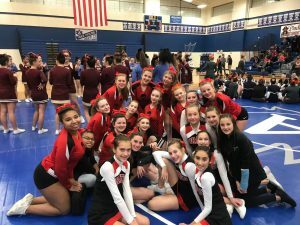 The girls performed their routines and scored high enough to finish second in their respective divisions. They are looking forward to carrying this momentum onto the weekend. The teams host their annual Blackout Cheerleading Invitational at the High School on Saturday starting at 9:00 am.